(1) “James defined true beliefs as those that prove useful to the believer.” I think so too. A person will keep a belief because it is restraining some confusion. It helps him to think. (2) “Truth is verifiable to the extent that thoughts and statements correspond with actual things, as well as the extent to which they “hang together,” or cohere, as pieces of a puzzle might fit together; these are in turn verified by the observed results of the application of an idea to actual practice.” Exactly so. Reality is mindfulness. It is what it is. Truth is the consistency among what is. This consistency exists between the thoughts and actual things. This consistency also exists among the thoughts themselves. An inconsistency indicates the presence of arbitrary assumptions. (3) “The most ancient parts of truth . . . also once were plastic. They also were called true for human reasons. They also mediated between still earlier truths and what in those days were novel observations.” All truths are relative to each other. They are also consistent with each other. This is the case no matter how far back one goes. There is no absolute truth. (4) “… the value of any truth was utterly dependent upon its use to the person who held it.” Yes, that would be personal truth. There is also broader truth that is based on reality regardless of personal viewpoint. The broader truth may be different from personal truth. (5) “… the world is a mosaic of diverse experiences that can only be properly interpreted and understood through an application of “radical empiricism.” [… the mind and its experiences, and nature are inseparable. ]” It is true that actual things and how they are perceived cannot be separated. No observation is truly objective. However, as we remove inconsistencies one by one, any observation can be brought closer to being objective. (6) “James’s emphasis on diversity as the default human condition—over and against duality, especially Hegelian dialectical duality—has maintained a strong influence in American culture…” That is correct. Awareness of ‘inconsistency’ is not necessarily a conflict between two opposites. It could be a more involved interaction. The inconsistency may not be resolved by a two- or multiple-valued logic. It may need to be approached with the infinite-valued logic of scales. (7) “The ‘facts’ themselves meanwhile are not true. They simply are. Truth is the function of the beliefs that start and terminate among them.” Yes, the facts simply ARE. The truth lies in the interpretation that demonstrates consistency among them. Any inconsistency shall reveal arbitrary assumptions. (8) “James seems to speak of truth in relativistic terms… he supported an epistemological realism position.” [Epistemological realism holds that what you know about an object exists independently of your mind.] When facts are simply taken for what they are, and the truth is measured in terms of consistency, or coherency, then it doesn’t matter whether an object exists independently of the mind or not. Epistemology (… from Greek ἐπιστήμη, epistēmē, meaning “knowledge, understanding”, and λόγος, logos, meaning “study of”) is the branch of philosophy concerned with the nature and scope of knowledge and is also referred to as “theory of knowledge”. It questions what knowledge is and how it can be acquired, and the extent to which knowledge pertinent to any given subject or entity can be acquired. Much of the debate in this field has focused on the philosophical analysis of the nature of knowledge and how it relates to connected notions such as truth, belief, and justification. The term “epistemology” was introduced by the Scottish philosopher James Frederick Ferrier (1808–1864). I shall now like to explore the subject of Epistemology through the Wikipedia article. Please see the comments below, which will be made over time. Epitemology = Study of knowledge, understanding = concerned with nature and scope of knowledge = “theory of knowledge” = what is knowledge? How can it be acquired? To what extent knowledge can be acquired in a subject? = What is truth? What are beliefs? What are justifications? (Wikipedia) In epistemology in general, the kind of knowledge usually discussed is propositional knowledge, also known as “knowledge that.” This is distinguished from “knowledge how” and “acquaintance-knowledge”. For example: in mathematics, it is known that 2 + 2 = 4, but there is also knowing how to add two numbers and knowing a person (e.g., oneself), place (e.g., one’s hometown), thing (e.g., cars), or activity (e.g., addition). Some philosophers think there is an important distinction between “knowing that,” “knowing how,” and “acquaintance-knowledge,” with epistemology being primarily concerned with the first of these. I wonder how these differences are significant. Therefore all awareness is knowledge? Therefore we have random access knowledge (i.e. RAM), also stored knowledge? You may say so. Each datum that we are aware of is a datum of knowledge. The relationships among such data of knowledge may be considered second tier of knowledge. There can be many such tiers of knowledge forming a multi-dimensional matrix of knowledge. Understanding the fourth dimension of space- time doesn’t yield easily. Our sense of, our abstraction of present time is quite relative and only present to ourselves. We locate one another and find one another using matrix synchronizing machines called clocks at least much as we use maps of the matrix. The matrix of knowledge develops into a matrix of beliefs with a dynamic matrix of “relationship logic” flowing through them. This, when compressed into a node in a larger matrix, becomes a recognizable “self”. (Wikipedia) In his paper On Denoting and his later book Problems of Philosophy Bertrand Russell stressed the distinction between “knowledge by description” and “knowledge by acquaintance”. Gilbert Ryle is also credited with stressing the distinction between knowing how and knowing that in The Concept of Mind. In Personal Knowledge, Michael Polanyi argues for the epistemological relevance of knowledge how and knowledge that; using the example of the act of balance involved in riding a bicycle, he suggests that the theoretical knowledge of the physics involved in maintaining a state of balance cannot substitute for the practical knowledge of how to ride, and that it is important to understand how both are established and grounded. This position is essentially Ryle’s, who argued that a failure to acknowledge the distinction between knowledge that and knowledge how leads to infinite regress. I can see that knowing something theoretically (balancing of different forces on paper) is different from knowing something experientially (balancing oneself on a bicycle). But this is simply knowledge at two different levels. There is also “width and depth of knowledge” which depends on the knowledge of associations and the common denominators underlying them. Thus, there is the dimension of abstraction. The idea of infinite regress becomes moot when all knowledge is looked upon as relative and it is understood that there is no absolute knowledge. (Wikipedia) In recent times, some epistemologists (Sosa, Greco, Kvanvig, Zagzebski) and Duncan Pritchard have argued that epistemology should evaluate people’s “properties” (i.e., intellectual virtues) and not just the properties of propositions or of propositional mental attitudes. I have no idea what that means or the use of it. (Wikipedia) In common speech, a “statement of belief” is typically an expression of faith and/or trust in a person, power or other entity — a paradigmatic example of such a statement of belief would be a declaration or affirmation of religious faith (as in, e.g., the Nicene Creed). While it addresses belief of this kind, epistemology is also concerned with belief in a very much broader sense of the word. In this broader sense “belief” simply means the acceptance as true of any cognitive content. To believe is to accept as true. I like James’ definition for belief. “Beliefs are those that prove useful to the believer…” That is why a person retains his beliefs and uses them. A belief may also be restraining a lot of confusion for the person. If a person’s belief is shaken he may get very confused. Strength of a person’s confusion may give strength to his belief. I would not define belief in terms of what is true. These two concepts are different. Some belief-filters can be very strong and make the person feel right about his actions. Belief-filters can provide justification for the most cruel and atrocious actions. It is belief-filters that have produced many Jihadis and Terrorists. I wonder if Epistemology leads to any resolution of belief-filters toward a more consistent reality. False data stripping takes a swipe at it. Understanding the underlying premise of how “computation” is used in Scientology (not normal English) is useful. Nothing works before some form of increasing mindfulness. Mindful subject clearing and epistemology can be grouped together, I think. A belief would be a certain awareness that a person maintains. He maintains that awareness because it helps him align other awarenesses (things that he is aware of). If he let’s the belief go, other awarenesses become random and difficult to relate with each other. Thus, beliefs are necessary to maintain sensible alignments among what one is aware of. Managing these relationships creates the subject of logic. I woke up this morning with the intention of writing to you so finding your latest post in my inbox was quite synchronistic. We have spoken before about the “existence of God” and recently I have been challenged to look further into this subject. Here are my latest thoughts. EXISTENCE EXISTS – this is a “self-evident” fact. If I now assign the name GOD to this axiom then strictly within these parameters it would be true to say GOD EXISTS, but at the same time acknowledging GOD DOES NOT EXIST on the basis that GOD IS EXISTENCE. Having established that God exists it becomes self-evident that I also exist as an essential part of the proof of the existence of God. I cannot have the same certainty that you exist as I have that both GOD and I exist, but since I am writing to you presupposes that you exist. Of course if you do not reply to this communication it may well reduce my certainty that there is a universe independent of mine. This whole procedure depends on the existence of the Physical Universe. I am reminded of what L Ron Hubbard has to say about the necessity of gaining CERTAINTY in all three universes – “Factor 28”. From that definition, KHTK seems to postulate God as “an undisturbed primordial field that contains no frequency, wavelength or period.” This primordial field when disturbed produces awareness, and therefore it is unknowable. This is a theoretical postulate by its nature, and not something actual. The postulate of God is true only to the degree that it brings consistency and coherency to the understanding of existence. After Epistemology, I want to look at the subject of Logic because that is what people use in their thinking. That is where the “self” lives. The ultimate identity seems to be the way one thinks. So this subject of “personal logic” is going to be very interesting. The logic in your post is quite interesting. There is certainly a logic built into the words one uses. “God” is a word that has Christian logic built into it. It has that flavor of “super self” even when one tries to use it in a more general sense. Maybe we should use the phrase “Starting postulate” instead of the word “God.” A “starting postulate” is true to the degree it brings coherency to the understanding of existence that follows. We can take EXISTENCE by its definition instead of trying to prove that it is what it says. All existence seems to boil down to awareness. It is the fact of awareness. It is anything that one can be aware of. Per the argument above, “I” would consist of a certain “logic” that is being used to process considerations. So, your “I” is quite evident from your post. This certainly makes one feel sort of naked. Haha! I am pretty naked myself on my blog. So, you are the logic that you are using to define “God” and its existence. I am the logic that defines “God” in a general way, and which also defines “existence” in a general way. The rest follows by itself. If you can see the “logic” that I am, then you wouldn’t doubt my existence. LOL! And you as a “logic” are under my microscope. “I” seems be constructed of a matrix of beliefs through which a certain logic flows. The “I’s” then form the nodes of a much larger matrix through which communication flows. A communication particle is what the logic of “I” spits out. Broadly, knowledge could be regarded as anything that one is aware of. Each datum that one is aware of is a datum of such knowledge. The relationships among such data of knowledge may be considered second tier of knowledge as “relationship logic”. There could be additional tiers of knowledge forming a multi-dimensional matrix of knowledge. The matrix of knowledge develops into a matrix of “static” beliefs with a “dynamic” relationship logic flowing through them. This matrix, when compressed may be regarded as a recognizable “self”. This “self” may become a node in a larger matrix where knowledge is being interchanged. Each datum of knowledge has its vector of awareness. The overall matrix of knowledge may be considered to have a vector of awareness that is the resultant of all its component vectors of awareness. Similarly, each belief has a static vector of awareness. Each relationship logic has a dynamic vector of awareness. “Self” consists of a complex matrix of beliefs and relationship logics. The awareness of “Self” is the resultant of all static and dynamic awareness vectors of its belief and logic components. (Wikipedia) “Whether someone’s belief is true is not a prerequisite for (its) belief. On the other hand, if something is actually known, then it categorically cannot be false. For example, if a person believes that a bridge is safe enough to support him, and attempts to cross it, but the bridge then collapses under his weight, it could be said that he believed that the bridge was safe but that his belief was mistaken. It would not be accurate to say that he knew that the bridge was safe, because plainly it was not. By contrast, if the bridge actually supported his weight, then he might say that he had believed that the bridge was safe, whereas now, after proving it to himself (by crossing it), he knows it to be safe. Knowledge happens to be relative because there is no one datum that is absolutely true. Therefore, truth of what one knows lies in the degree of consistency, or coherency, among all that one knows. When one comes across a new datum, one compares it to what one already knows in order to decide upon the truth of this new datum. The truth is decided by the consistency, or coherency, of the new datum with what one already knows. The immediate level of truth is established by seeing a datum for what it is without knowingly using filters (assumptions, bias, prejudice and fixed ideas). The next level of truth is obtained by associating the datum with what one already knows. If inconsistencies now appear then one must resolve them. In this process of resolution one may discover filters that one was using unknowingly. The degree of truth improves as filters are discovered and made inactive. (Wikipedia) In many of Plato’s dialogues, such as the Meno and, in particular, the Theaetetus, Socrates considers a number of theories as to what knowledge is, the last being that knowledge is true belief that has been “given an account of” (meaning explained or defined in some way). According to the theory that knowledge is justified true belief, in order to know that a given proposition is true, one must not only believe the relevant true proposition, but one must also have a good reason for doing so. One implication of this would be that no one would gain knowledge just by believing something that happened to be true. For example, an ill person with no medical training, but with a generally optimistic attitude, might believe that he will recover from his illness quickly. Nevertheless, even if this belief turned out to be true, the patient would not have known that he would get well since his belief lacked justification. The definition of knowledge as justified true belief was widely accepted until the 1960s. At this time, a paper written by the American philosopher Edmund Gettier provoked major widespread discussion. “Justification” means “that which makes it right.” It would be something that helps remove inconsistency among what one is aware of. A “belief” would be an awareness that is maintained. It is fixed awareness that does not change. “True belief” would be a belief that is consistent with other things that one is aware of. “Justified true belief” would be a true belief that is demonstrably coherent and consistent with reality. Knowledge as “justified true belief” is not only coherent within itself but it is also demonstrably consistent with reality time after time (not as a onetime guess). 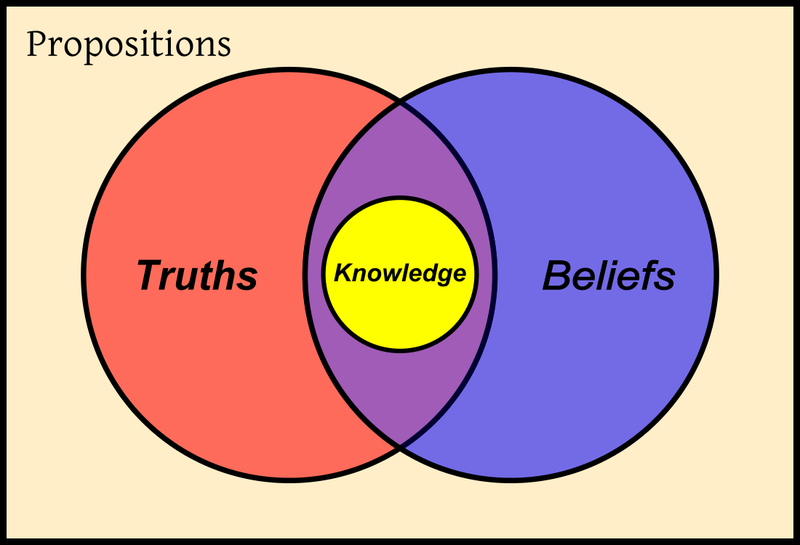 (Wikipedia) Euler diagram representing a definition of knowledge. Edmund Gettier is best known for a short paper entitled ‘Is Justified True Belief Knowledge?’ published in 1963, which called into question the theory of knowledge that had been dominant among philosophers for thousands of years. In a few pages, Gettier argued that there are situations in which one’s belief may be justified and true, yet fail to count as knowledge. That is, Gettier contended that while justified belief in a true proposition is necessary for that proposition to be known, it is not sufficient. As in the diagram, a true proposition can be believed by an individual (purple region) but still not fall within the “knowledge” category (yellow region). According to Gettier, there are certain circumstances in which one does not have knowledge, even when all of the above conditions are met. Gettier proposed two thought experiments, which have come to be known as “Gettier cases,” as counterexamples to the classical account of knowledge. One of the cases involves two men, Smith and Jones, who are awaiting the results of their applications for the same job. Each man has ten coins in his pocket. Smith has excellent reasons to believe that Jones will get the job and, furthermore, knows that Jones has ten coins in his pocket (he recently counted them). From this Smith infers, “the man who will get the job has ten coins in his pocket.” However, Smith is unaware that he also has ten coins in his own pocket. Furthermore, Smith, not Jones, is going to get the job. While Smith has strong evidence to believe that Jones will get the job, he is wrong. Smith has a justified true belief that a man with ten coins in his pocket will get the job; however, according to Gettier, Smith does not know that a man with ten coins in his pocket will get the job, because Smith’s belief is “…true by virtue of the number of coins in Jones’s pocket, while Smith does not know how many coins are in Smith’s pocket, and bases his belief…on a count of the coins in Jones’s pocket, whom he falsely believes to be the man who will get the job.” These cases fail to be knowledge because the subject’s belief is justified, but only happens to be true by virtue of luck. In other words, he made the correct choice (in this case predicting an outcome) for the wrong reasons. This example is similar to those often given when discussing belief and truth, wherein a person’s belief of what will happen can coincidentally be correct without his or her having the actual knowledge to base it on. In Gettier case, justification is being used in a narrow sense where outcome is similar to making a “onetime guess.” It is not a justification where the true belief is demonstrably consistent with reality time after time as is the case when using the scientific method or mindfulness. (Wikipedia) The responses to Gettier have been varied. Usually, they have involved substantial attempts to provide a definition of knowledge different from the classical one, either by recasting knowledge as justified true belief with some additional fourth condition, or as something else altogether. The Gettier case depends on onetime luck. It does not take justification to mean “consistent with reality time after time.” All one needs to do is to provide a better definition of justification. Knowledge as “justified true belief” is not only coherent within itself but it is also demonstrably consistent with reality time after time (not as a onetime guess or luck). (Wikipedia) In one response to Gettier, the American philosopher Richard Kirkham has argued that the only definition of knowledge that could ever be immune to all counterexamples is the infallibilist one. To qualify as an item of knowledge, goes the theory, a belief must not only be true and justified, the justification of the belief must necessitate its truth. In other words, the justification for the belief must be infallible. Infallibilism is, in epistemology, the position that knowledge is, by definition, a true belief which cannot be rationally doubted. Other beliefs may be rationally justified, but they do not rise to the level of knowledge unless absolutely certain. Infallibilism’s opposite, fallibilism, is the position that a justified true belief may be considered knowledge, even if we can rationally doubt it. Fallibilism is not to be confused with skepticism, which is the belief that knowledge is unattainable for rational human beings. This is similar to modifying the definition of “justified” as “consistent with reality time after time” and not just a onetime thing per guess or luck. This does not necessarily imply infallibilism. The postulate of constant speed of light in Einstein’s Theory of Relativity is not infallible. But the Theory of Relativity has become part of our knowledge. (Wikipedia) Yet another possible candidate for the fourth condition of knowledge is indefeasibility. Defeasibility theory maintains that there should be no overriding or defeating truths for the reasons that justify one’s belief. For example, suppose that person S believes he saw Tom Grabit steal a book from the library and uses this to justify the claim that Tom Grabit stole a book from the library. A possible defeater or overriding proposition for such a claim could be a true proposition like, “Tom Grabit’s identical twin Sam is currently in the same town as Tom.” When no defeaters of one’s justification exist, a subject would be epistemically justified. The type of situation is also addressed by modifying the definition of “justified” as “consistent with reality time after time” and not just a onetime thing per guess, luck or circumstance. The implication here is that information should not be claimed as knowledge based on onetime guess, luck or circumstance. If it is onetime information only then it should be checked and verified thoroughly with reality in other ways before claiming it as knowledge. The immediate level of truth is established by seeing a datum for what it is without any filters (assumptions, bias, prejudice and fixed ideas) distorting the perception. The next level of truth is obtained by associating the datum with what one already knows. If inconsistencies now appear then one must resolve them. In this process of resolution one may discover filters that one was using unknowingly. (Wikipedia) Reliabilism has been a significant line of response to the Gettier problem among philosophers, originating with work by Alvin Goldman in the 1960s. According to reliabilism, a belief is justified (or otherwise supported in such a way as to count towards knowledge) only if it is produced by processes that typically yield a sufficiently high ratio of true to false beliefs. In other words, this theory states that a true belief counts as knowledge only if it is produced by a reliable belief-forming process. This is similar to modifying the definition of “justified” as “consistent with reality time after time” and not just a onetime thing per guess, luck or circumstance. This produces reliability. •	if P is true, S will believe that P.
Nozick argues that the third of these conditions serves to address cases of the sort described by Gettier. Nozick further claims this condition addresses a case of the sort described by D. M. Armstrong: A father believes his daughter innocent of committing a particular crime, both because of faith in his baby girl and (now) because he has seen presented in the courtroom a conclusive demonstration of his daughter’s innocence. His belief via the method of the courtroom satisfies the four subjunctive conditions, but his faith-based belief does not. If his daughter were guilty, he would still believe her innocent, on the basis of faith in his daughter; this would violate the third condition. The British philosopher Simon Blackburn has criticized this formulation by suggesting that we do not want to accept as knowledge beliefs, which, while they “track the truth” (as Nozick’s account requires), are not held for appropriate reasons. He says that “we do not want to award the title of knowing something to someone who is only meeting the conditions through a defect, flaw, or failure, compared with someone else who is not meeting the conditions.” In addition to this, externalist accounts of knowledge, such as Nozick’s, are often forced to reject closure in cases where it is intuitively valid. This response adds a self-centric viewpoint. Scientific thought is reality-centric and does not assume a self, which is constructed out of belief and logic. Therefore, knowledge to be knowledge must be mathematically predictable, therefore deterministic? (1) All knowledge is relative. (2) There is no datum of knowledge that is absolute. The associations among data are not linear. They are in the form of a multi-dimensional matrix.
. . . and fractal. Aware of being aware can be streatched into an infinite fractal like recursion. But then one can simply be aware of itself. I am glad that somebody seems to be reading this very dry stuff. I cannot wade through the volumes that you are. I am reading your summations and then back-skimming the material if I am curious as to your reference. (Wikipedia) Part of the debate over the nature of knowledge is a debate between epistemological externalists on the one hand, and epistemological internalists on the other. Externalists hold that factors deemed “external”, meaning outside of the psychological states of those who gain knowledge, can be conditions of knowledge. For example, an externalist response to the Gettier problem is to say that, in order for a justified true belief to count as knowledge, there must be a link or dependency between the belief and the state of the external world. Usually this is understood to be a causal link. Such causation, to the extent that it is “outside” the mind, would count as an external, knowledge-yielding condition. Internalists, on the other hand, assert that all knowledge-yielding conditions are within the psychological states of those who gain knowledge. Though unfamiliar with the internalist/externalist debate himself, many point to René Descartes as an early example of the internalist path to justification. He wrote that, because the only method by which we perceive the external world is through our senses, and that, because the senses are not infallible, we should not consider our concept of knowledge to be infallible. The only way to find anything that could be described as “indubitably true,” he advocates, would be to see things “clearly and distinctly”. He argued that if there is an omnipotent, good being who made the world, then it’s reasonable to believe that people are made with the ability to know. However, this does not mean that man’s ability to know is perfect. God gave man the ability to know, but not omniscience. Descartes said that man must use his capacities for knowledge correctly and carefully through methodological doubt. The dictum “Cogito ergo sum” (I think, therefore I am) is also commonly associated with Descartes’ theory, because in his own methodological doubt, doubting everything he previously knew in order to start from a blank slate, the first thing that he could not logically bring himself to doubt was his own existence: “I do not exist” would be a contradiction in terms; the act of saying that one does not exist assumes that someone must be making the statement in the first place. Though Descartes could doubt his senses, his body and the world around him, he could not deny his own existence, because he was able to doubt and must exist in order to do so. Even if some “evil genius” were to be deceiving him, he would have to exist in order to be deceived. This one sure point provided him with what he would call his Archimedean point, in order to further develop his foundation for knowledge. Simply put, Descartes’ epistemological justification depended upon his indubitable belief in his own existence and his clear and distinct knowledge of God. Such a debate is moot if we use the following model. (1)	Self is defined as a matrix of beliefs and relationship logics that is embedded within the larger matrix of reality. This is the reality-centric view. (2)	Truth is defined as consistency and coherency among beliefs. (3)	Justification is defined as repeatable consistency with reality. (4)	An inconsistency indicates the presence of filters (assumption, bias, prejudice, and fixed ideas) that distort the perception of reality. (5)	Current models are based on a self-centric view that makes reality a subset of self..
Descartes was looking through a self-centric filter, which made reality the subset of self (God). A Self-centric view will always find self to be there. It would never perceive self to be not there because this viewpoint is there only when self is there. A reality-centric approach can see self as starting, continuing and ending. For me, this is profound and an important underpinning to all your work. It demonstrably shows the fallacy of self as an important ingredient let alone source of reality. Yet there are appropriate times to take a self-centric look at things and these analyses remain consistent. Sure! The reality-centric view is inclusive of the self-centric view. But the self-centric view is not inclusive of the reality-centric view..
(Wikipedia) A formulation of the value problem in epistemology first occurs in Plato’s Meno. The problem is to identify what is it about knowledge (if anything) that makes it more valuable than mere true belief, or that makes knowledge more valuable than a more minimal conjunction of its components on a particular analysis of knowledge. The value problem re-emerged in the philosophical literature on epistemology in the twenty-first century following the rise of virtue epistemology in the 1980s, partly because of the obvious link with the concept of value in ethics. The value problem has been presented as an argument against epistemic reliabilism by philosophers including Linda Zagzebski, Wayne Riggs and Richard Swinburne. Zagzebski gives a thought experiment to illustrate the unimportance of the belief being produced by a reliable process: imagine you go to a coffee machine and attempt to have it produce you a cup of coffee. The machine you use might reliably produce coffee, or it might not. Imagine one machine had a 90% chance of producing you coffee while another only had a 40% chance. If you happen to choose the 40% chance machine and it produces you a cup of coffee, the fact that it does not reliably produce coffee does not change the value that the coffee has to you. Similarly, if you have a true belief achieved through an unreliable process, Zagzebski argues that there’s no particular reason that has less value than one produced through a reliable process. Advocates of virtue epistemology have argued that the value of knowledge comes from an internal relationship between the knower and the mental state of believing. One of the more influential responses to the problem is that knowledge is not particularly valuable and is not what ought to be the main focus of epistemology. Instead, epistemologists ought to focus on other mental states, such as understanding. (1)	How much confusion it is restraining for the person. For example, if that belief is shaken how much will the person be overwhelmed by confusion. (2)	How useful is that belief in assisting the person in the pursuit of his goals. Here the belief is useful to the person in aligning new data to bring about movement toward his goals. The whole purpose of a priori knowledge would be to establish consistency among a posteriori knowledge. A posteriori knowledge is what it is. It cannot be disputed once it is clearly perceived for what it is. But if there are gaps in this knowledge, a model is needed to fill such gaps. An example of this would be the Periodic Table. Such a model shall be generated by making some postulates. These postulates would constitute a priori knowledge. (Wikipedia) Immanuel Kant, in his Critique of Pure Reason, drew a distinction between “analytic” and “synthetic” propositions. He contended that some propositions are such that we can know them to be true just by understanding their meaning. For example, consider, “My father’s brother is my uncle.” We can know it to be true solely by virtue of our understanding what its terms mean. Philosophers call such propositions “analytic.” Synthetic propositions, on the other hand, have distinct subjects and predicates. An example of a synthetic proposition would be, “My father’s brother has black hair.” Kant stated that all mathematical and scientific statements are synthetic a priori propositions because they are necessarily true but our knowledge about the attributes of the mathematical or physical subjects we can only get by logical inference. The American philosopher W. V. O. Quine, in his “Two Dogmas of Empiricism”, famously challenged the distinction, arguing that the two have a blurry boundary. Some contemporary philosophers have offered more sustainable accounts of the distinction. ‘Analytic’ is a non-contradictory statement with a predicate. It is self-evident being a tautology. It can stand by itself. ‘Synthetic’ is a non-contradictory statement without a predicate. The predicate, which completes the meaning, is logically inferred. (Wikipedia) The historical study of philosophical epistemology is the historical study of efforts to gain philosophical understanding or knowledge of the nature and scope of human knowledge. Since efforts to get that kind of understanding have a history, the questions philosophical epistemology asks today about human knowledge are not necessarily the same as they once were. But that does not mean that philosophical epistemology is itself a historical subject, or that it pursues only or even primarily historical understanding. The effort here is to understand the nature and scope of human knowledge. (Wikipedia) In philosophy, empiricism is generally a theory of knowledge focusing on the role of experience, especially experience based on perceptual observations by the senses. Certain forms treat all knowledge as empirical, while some regard disciplines such as mathematics and logic as exceptions. There are many variants of empiricism, positivism and realism being among the most commonly expounded but central to all empiricist epistemologies is the notion of the epistemologically privileged status of sense data. The focus here is on knowledge based on perceptual observations by the senses. (Wikipedia) Many idealists believe that knowledge is primarily (at least in some areas) acquired by a priori processes or is innate—for example, in the form of concepts not derived from experience. The relevant theoretical processes often go by the name “intuition”. The relevant theoretical concepts may purportedly be part of the structure of the human mind (as in Kant’s theory of transcendental idealism), or they may be said to exist independently of the mind (as in Plato’s theory of Forms). The basis of knowledge is awareness. Without awareness there shall be no knowledge. Therefore, knowledge must start out with awareness being aware of itself. (Wikipedia) By contrast with empiricism and idealism, which centres around the epistemologically privileged status of sense data (empirical) and the primacy of Reason (theoretical) respectively, modern rationalism adds a third ‘system of thinking’, (as Gaston Bachelard has termed these areas) and holds that all three are of equal importance: The empirical, the theoretical and the abstract. For Bachelard, rationalism makes equal reference to all three systems of thinking. An example of abstract thinking is Pythagoras’ concept of ‘pure’ geometric forms: perfect triangles, squares, circles, etc. Another example is imaginary numbers, in mathematics. The key systems of thinking are specified above as empirical, theoretical, and the abstract. The ‘empirical’ does not bother about how reality comes about in the first place. The ‘theoretical’ considers the origins of reality. And the ‘abstract’ tries to relate empirical to the theoretical. Constructivism seems to be a self-centric view of knowledge. All knowledge is relative. There is no datum of knowledge that is absolute. Ultimately, it boils down to knowledge being tautological. Infinitism assumes possible convergence to some absolute datum. Foundationalists respond to the regress problem by asserting that certain “foundations” or “basic beliefs” support other beliefs but do not themselves require justification from other beliefs. These beliefs might be justified because they are self-evident, infallible, or derive from reliable cognitive mechanisms. Perception, memory, and a priori intuition are often considered to be possible examples of basic beliefs. Foundationalism assumes basic beliefs that are absolute. I prefer Coherentism. There is nothing wrong with circularity. Circularity is not “spectacularly uninformative” when the radius is infinitely large. A position known as “foundherentism”, advanced by Susan Haack, is meant to be a unification of foundationalism and coherentism. One component of this theory is what is called the “analogy of the crossword puzzle.” Whereas, for example, infinitists regard the regress of reasons as “shaped” like a single line, Susan Haack has argued that it is more like a crossword puzzle, with multiple lines mutually supporting each other. A single straight line is part of a circle with infinite radius. I can see a sphere with infinite radius as a model for knowledge . Skepticism is related to the question of whether a certain knowledge is possible. If point B cannot be proven before point A, and if in order to prove point A it must be established with absolute certainty, then skepticism argues that it is difficult to prove any point at all. Skeptics argue that the belief in something does not necessarily justify an assertion of knowledge of it. In this skeptics oppose foundationalism, which states that there have to be some basic beliefs that are justified without reference to others. The skeptical response to this can take several approaches. First, claiming that “basic beliefs” must exist, amounts to the logical fallacy of argument from ignorance combined with the slippery slope. While a foundationalist would use Münchhausen trilemma as a justification for demanding the validity of basic beliefs, a skeptic would see no problem with admitting the result. Early in the 20th century, the notion that belief had to be justified as such to count as knowledge lost favour. Fallibilism is the view that knowing something does not entail certainty regarding it. Charles Sanders Peirce was a fallibilist and the most developed form of fallibilism can be traced to Karl Popper (1902–1994) whose first book Logik Der Forschung (The Logic of Scientific Discovery), 1934 introduced a “conjectural turn” into the philosophy of science and epistemology at large. He adumbrated a school of thought that is known as Critical Rationalism with a central tenet being the rejection of the idea that knowledge can ever be justified in the strong form that is sought by most schools of thought. His two most helpful exponents are the late William W Bartley and David Miller, recently retired from the University of Warwick. A major source of on-line material is the Critical Rationalist website and also the Rathouse of Rafe Champion. 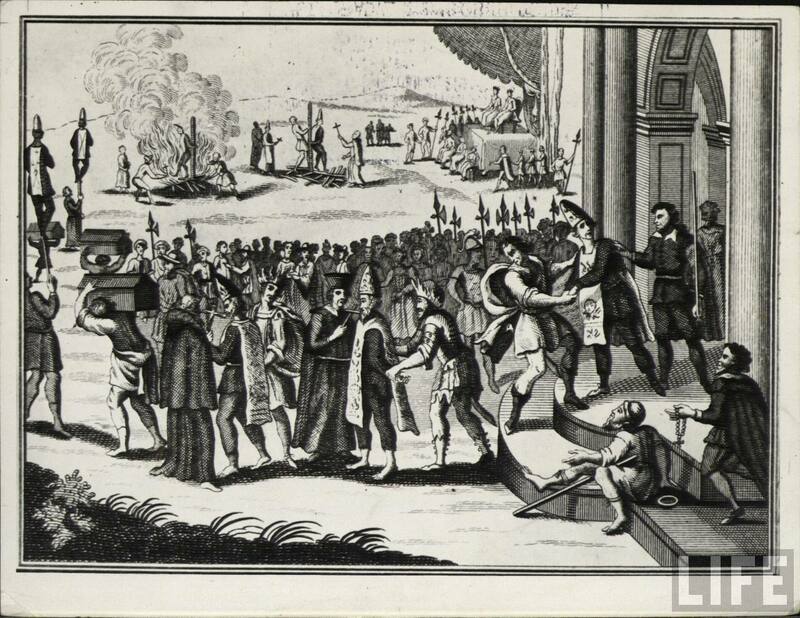 (Wikipedia) Fallibilism (from medieval Latin fallibilis, “liable to err”) is the philosophical principle that human beings could be wrong about their beliefs, expectations, or their understanding of the world, and yet still be justified in holding their incorrect beliefs. In the most commonly used sense of the term, this consists in being open to new evidence that would contradict some previously held position or belief, and in the recognition that “any claim justiﬁed today may need to be revised or withdrawn in light of new evidence, new arguments, and new experiences.” This position is taken for granted in the natural sciences. I support this view as expressed under fallibilism. Epistemic culture distinguishes between various settings of knowledge production and stresses their contextual aspects. Coined by Karin Knorr-Cetina in her book Epistemic Cultures; she defines epistemic cultures as an “amalgam of arrangements and mechanisms—bonded through affinity, necessity and historical coincidence—which in a given field, make up how we know what we know”. The term provides the conceptual framework used to demonstrate that different laboratories do not share the same “scientific” knowledge production model, but rather each is endowed with a different epistemic culture prescribing what is adequate knowledge and how it is obtained. Since its introduction, the term has been picked up and used by various researchers engaging in science and technology studies. How we know what we know can have different conceptual frameworks.